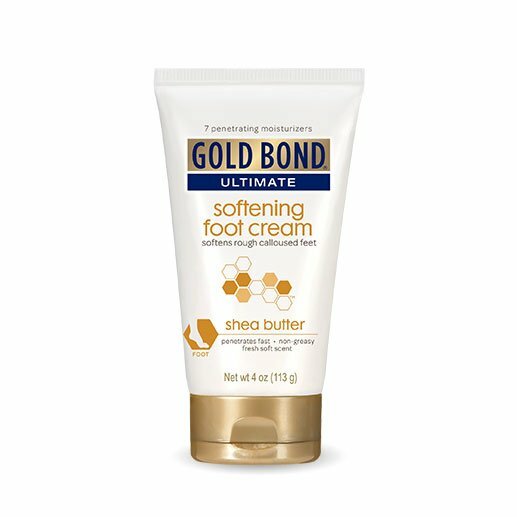 Gold Bond Ultimate Softening Foot Cream With Shea Butter 4oz has been formulated to help you with any skin ailment you may have. Designed to support multiple kinds of skin ailments, Gold Bond skin care products can aid you with repairing, moisturizing, and calming your skin. ADW Diabetes offers a wide selection of Gold Bond skin creams, powders, and lotions in both single units and discounted bulk packs for your convenience. Gold Bond Ultimate Softening Foot Cream With Shea Butter 4oz features seven penetrating moisturizers and three vitamins, this daily moisturizer can repair even the toughest skin. As the cream is applied to rough, dry, cracked feet, it creates a protective layer of moisture thanks to a unique blend of hydralast emollients and humectants which soften skin and help retain moisture for up to 24-hours. Don't make your feet wait any longer. Get Gold Bond Ultimate Softening Foot Cream and get your feet smoother than ever. Ideal for: Rough, Calloused Feet. Unique blend of Hydralast emollients and humectants draw moisture throughout the day for 24 hour moisturization. Softening moisturizers and 3 vitamins penetrate to condition and repair even the toughest skin.